THE North West is being "left behind" in the terms of economic growth, infrastructure and job creation, according to the Construction Industry Federation (CIF). A CIF delegation met on Monday with Independent MEP Marian Harkin to "chart a path to recovery" for the North West, West and Midlands. CIF western region director, Justin Molloy said: "The West, Midlands and North West regions are still experiencing recession and have yet to see a recovery. Policy-makers need to recognise the economic and social benefits of balanced economic growth across these regions as they provide thousands of jobs and generate significant economic growth. 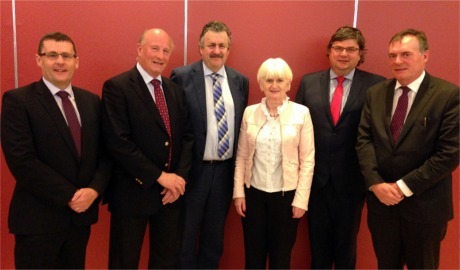 Pictured at a delegate meeting with Independent MEP Marian Harkin on June 20, 2016 are Justin Molloy, CIF; Charles Wills, Wills Brothers Ltd; Dominic Doheny, John Flanagan Developments Ltd; Ms Harkin; Paul Carey, Carey Building Contractors Ltd and Brendan Henry, Kilcawley Construction. "The Government must take a number of steps to ensure that these regions are not left behind," he added. The CIF said the construction industry is hiring an extra 1,000 people a month in the North West, Midlands and West. "Significant investment in infrastructure in the regions will generate employment in the construction industry; that in turn will support regional economic growth and in time provide a counter-balance to the rapid disproportionate growth of Dublin. "At the moment, the economic gravity of Dublin is leading to young people leaving the regions seek employment and opportunity. In the long-term, if not addressed, these regions could isolated and stagnate." Mr Molloy said his organisation met with Ms Harkin to discuss how the EU "can support regional development and how current government policy needs to be changed to generate economic growth in the regions". He said among the topics of discussion were the streamlining of the housebuilding planning process and the way SMEs and contractors tender for public procurement contracts. "Providing this access will help SMEs in the region grow and ultimately hire more people," added Mr Molloy.